I recently had the pleasure of working with Heather Bailey’s latest line (just arriving in stores now!) Lottie Da. Isn’t it dreamy? This is Classic Heather Bailey colors and vintage feel. 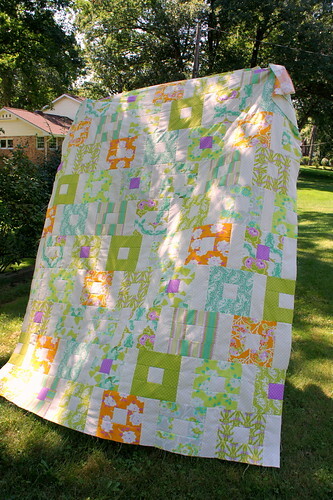 I used a new pattern of Heather’s (that I believe she will have available for free, but don’t quote me on that) to make this quilt top. The colors I worked with all evoked a dreamy feel for me. This quite top pattern is soft and subtle. It was interesting in particular to work with all prints and no solids. But Heather cleverly uses some blender fabrics from her line to act as solids, in particular the white with fuchsia square dot print (which I’m sure has a lovely name lol). I did develop a couple of favorite prints though. How can you not? This orange floral print above is a definite favorite of mine as well as the grey/teal version of the same print that you can see to the upper right above the orange (just saw that they are named Tangerine Sprig and Dove Sprig). Those ones made me smile every time I got to work on a block with them. There is a teal/grey and fuchsia print that I adored as well, but it is harder to see the larger scale print here because it is chopped into smaller pieces for the pattern. 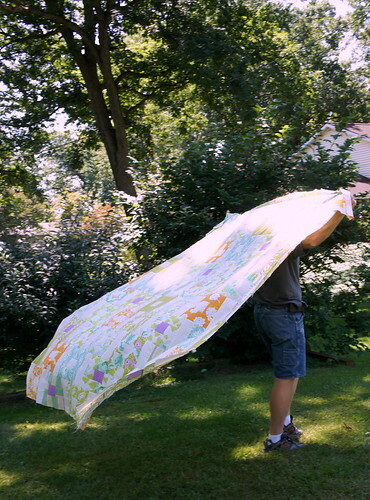 But I would use it to back a quilt in a heartbeat. It is called Turquoise Duphine and you can see it here at the Fat Quarter Shop. There is a yummy scallop stripe print that I think would be darling to fussy cut for a project. Having a little girl, I just see lots of little girl items when I see Heather’s lines. They are so perfectly feminine! Sewing Room Swap – Received! Didn't mean to comment as the guild. I love this top! This line is so fun and the scallop stripe is great. I got to meet Heather at Spring Quilt Market and she was delightful, and she even came to the after party PMQG threw with one of our sponsors! 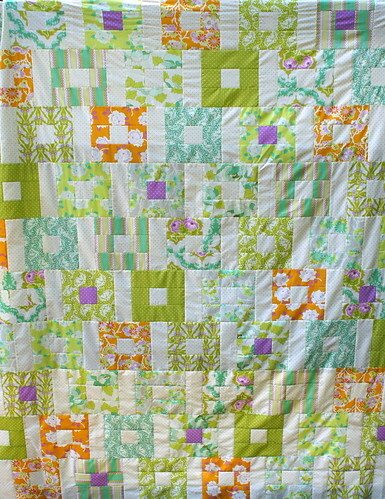 The sashing actually isn't white, but a white print with the purple square dot print from Heather's line. It's called Cream Lottie Dot. Beautiful! I was just putting these prints in and out of my online shopping cart last night, trying to decide which ones to buy. Oh, the choices! very nice! Love the orange flower print too! 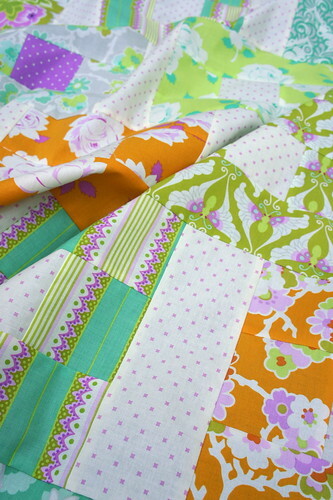 That orange floral is one of my favorites from this new line as well and those square dots! 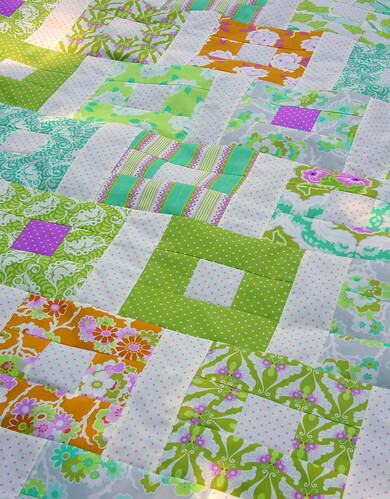 Your quilt top looks great! I was also really excited when I heard that she is going to be speaking at sewing summit – some of the first fabrics I bought were from one of her collections! Those are beautiful colors in this new fabric line. The purple-ish and the lime greens are my favorites. Not too fond of the orange, but it all works well together so what do I know. LOL It's a beautiful quilt. Lovely quilt. It has a very calm feel to it. Beautiful! Beautiful! 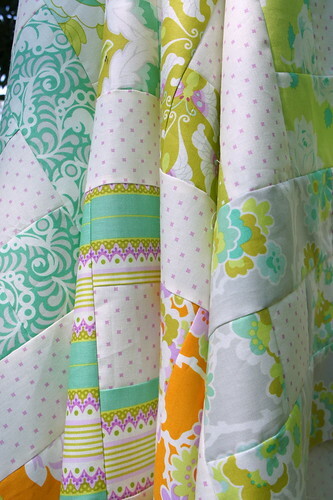 Love the fabric and adore the pattern! You did a great job!!! Thank you! 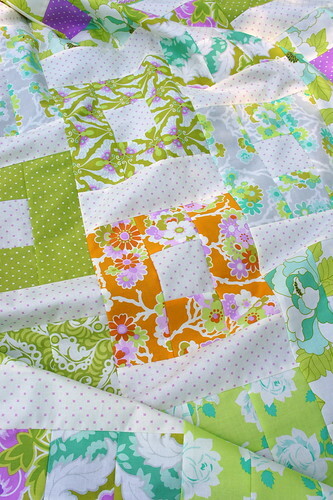 It was a quick and easy pattern to make with beautiful fabrics. Beautiful! Great Job! Do you know if this pattern is available yet?